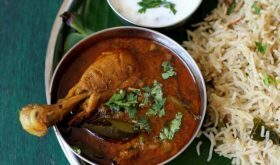 Bellam Thalikalu is a classic Andhra style festival dish that is usually prepared for Vinayaka Chavithi. 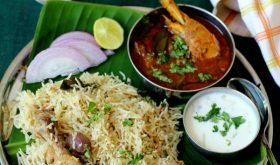 Thalikalu are small and thin noodles prepared with either rice flour or whole wheat flour or a mixture of rice flour, whole wheat flour and semolina (sooji). These hand made noodles are cooked in a cardamom flavored jaggery (bellam in telugu) syrup and garnished with nuts and roasted poppy seeds. It also goes by the name Thalikala Payasam (kheer). 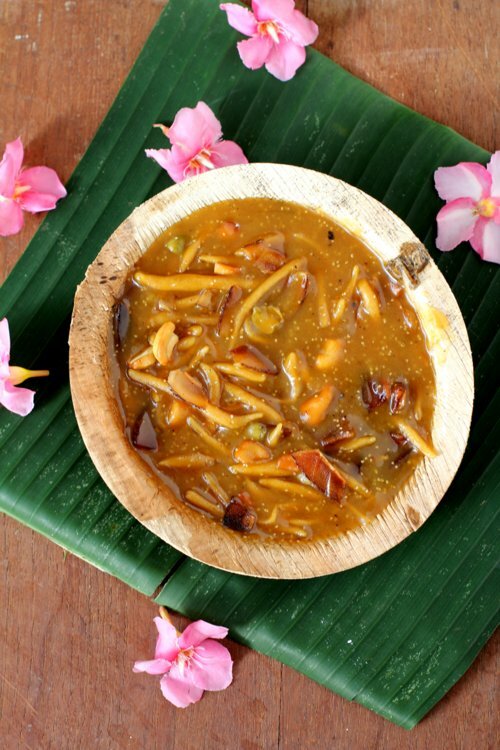 Another popular version is to prepare thalikalu with rice flour and simmer it in jaggery syrup. Both the varieties are tasty. Do give them a try and make an offering to Lord Ganesha for Ganesh Chaturthi. 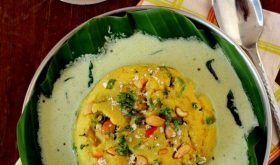 A few more Vinayaka Chavithi recipes Andhra style that you can make for Ganesh pooja. In a bowl, add whole wheat flour (atta) and salt and mix. Slowly add enough water to make a firm dough. Set aside for a few mts while you prepare the jaggery syrup. Heat ghee in a heavy bottomed vessel, add cashew nuts and allow to turn golden brown. Remove them and set aside. In the same vessel, add 3 cups water and bring to a boil. Add grated jaggery and allow to melt. Reduce flame to medium, allow to simmer and thicken lightly. While the jaggery is simmering, prepare small balls of the flour dough and roll each ball into a thin long noodle. Place the rolled out noodles on a lightly floured plate. Once all they are done, sprinkle some rice flour or whole wheat flour on them and lightly mix so that they don't stick to each other. Once the jaggery syrup lightly thickens, add the prepared noodles and simmer on low till they cook. It could take 15-18 mts approx. You will find that the jaggery syrup will thicken. Towards the end of the cooking process, sprinkle roasted poppy seeds, roasted nuts, coconut pieces and cardamom powder. Mix well. The jaggery syrup should not be too thick or too thin. 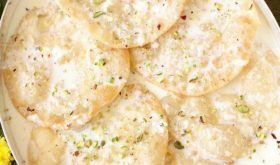 You can even add crushed fennel seeds (saunf). If you do not have dried coconut, you can use fresh coconut. Or you can omit coconut if you do not have it on hand. 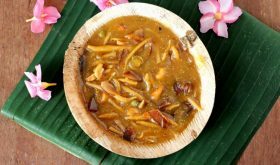 If the jaggery syrup is too thin, you can sprinkle a tbsp of rice flour and mix to thick the payasam. By Sailu Published: August 28, 2014 Bellam Thalikalu is a sweet dish made with whole wheat flour, jaggery and cardamom. 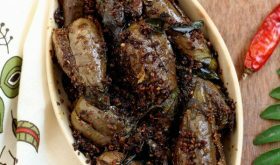 Vinayaka Chavithi recipe, Andhra style dish. Ganesh Chaturthi special! Looks interesting.Have never seen or heard about thalikalu,love the coconut topping.